On August 5th 2007 Ed was selected by a panel of judges as the "Trainer Challenge Champion" of the North Carolina Equine Extravaganza in Raleigh, NC and on October 28, 2007 Ed was selected by a panel of judges as the "Trainer Challenge Champion" of the Virginia Equine Extravaganza in Richmond, VA having competed throughout both weekend events against other professional trainers in starting young colts. Natural Horsemanship is a skill and an art and starting young horses is one of the most effective ways to illustrate the many facets of natural horsemanship. The Virginia Equine Extravaganza® is proud to feature a colt starting trainer challenge in which three trainers will demonstrate their natural horsemanship skills as they work with young horses to get them ready to accept a saddle and rider. 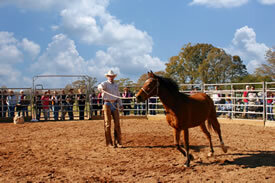 Ed will also be presenting several informative horsemanship demonstrations scheduled at various times during the Equine Extravaganza. Congratulations again on winning the Trainers Challenge at the Raleigh Extravaganza. We raised the 3 horses that participated in the Trainers Challenge, so we all know what a difficult challenge you specifically had. We could not have been more pleased with the way you handled "Dallas" and we thank you for giving him such a positive start with regards to his first training sessions and his first rides. Your win was very much deserved. Best of luck to you in the upcoming challenge in Virginia. All of us here at the Equine Unit will be rooting for you! Richmond, VA, October 28, 2007 – Ed Dabney has emerged as the new Champion of Equine Extravaganza’s East Coast Trainer’s Challenge after a clean sweep of two exciting competitions. Ed walked away with a victory in North Carolina in August of this year, and rejoined the competition for the final showdown in Virginia on October 28th, alongside fellow competitors Bob Jeffries and Kenny Harlow. The East Coast Trainer’s Challenge showcases natural horse training methods in a three day competition featuring three renowned trainers working with three untrained horses before a panel of judges who are evaluating the techniques employed by the trainers. The trainers draw for their individual colt and then are allowed only one hour per day over the three day period in which to work with the horse. 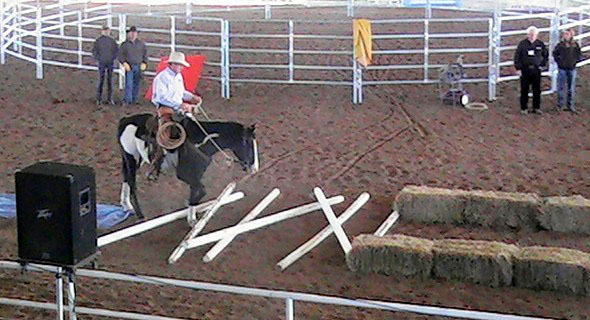 The primary focus of the event is for the trainer to display an ability to read the horse and accomplish as much training as possible without over-stressing the young horse physically or mentally. 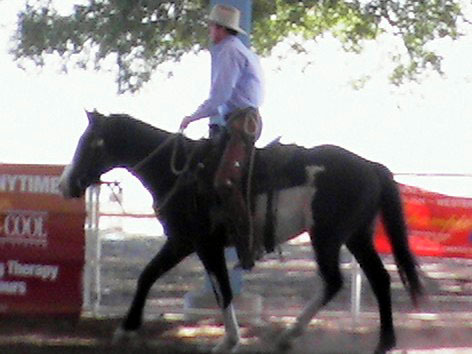 After the designated three day period, competitors are expected to be able to gain the trust of their colts and, if possible, demonstrate the ability to walk, trot and canter in an open arena as well as negotiate a number of impressive obstacles such as bridges, barking dogs, lariats, and tarps. Ed Dabney was sponsored in the Trainer’s Challenge by HorseSouth magazine and Sundowner Trailers of Georgia. 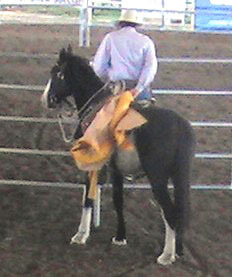 Ed Dabney is a Wyoming horseman with over 30 years experience using natural horsemanship techniques working with horses in the ranching, movie and training industries. Ed currently presents Horsemanship Clinics internationally on topics as varied as Classical Equitation, Fear Management and Ranch Horsemanship. Residing now near Athens, GA, Ed accepts horses for training, teaches riding and horsemanship lessons and produces instructional videos. 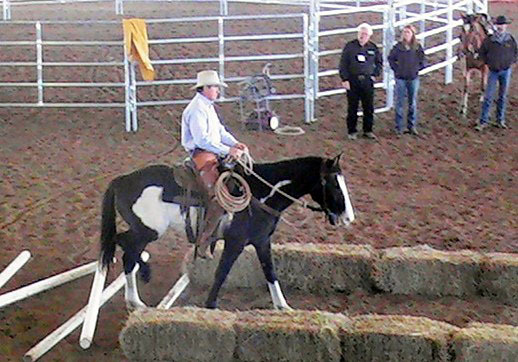 Ed’s training articles have been published in numerous horse related magazines and his “Gentle Horsemanship” television program has been seen on RFD-TV. VSH is proud to have been invited to provide horses for the Virginia Equine Extravaganza East Coast Trainers' Challenge in both 2006 and 2007. This year three of our signature Clydesdale crosses (Flash, Aramis, and Brogan) were trained live each day as three of the Top Natural Horsemanship Trainers competed for the title of East Coast Champion. Flash was the Champion of the 2007 East Coast Trainers' Challenge, along with trainer Ed Dabney. 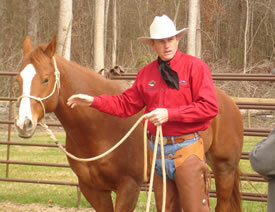 Ed is a 5th generation horse trainer who was also the Champion of the North Carolina Trainers' Challenge. Flash was trained in front of a live audience in 3 one hour sessions. Ed made significant use of a well trained pony horse and spent a lot of time desensitizing Flash to ropes, rain coats, tarps and various objects on the ground. He was ground driven and taught to give to the bit and yeild to pressure prior to being backed. Ed was riding Flash about one hour into the competition and cantering him around the arena with plastic signs moving in the wind and a PA system anchored to the arena walls. At one point Ed and Flash "raced" Kenny Harlow and Brogan from one end of the arena to the other. For the grand finale, Ed roped a plastic steer from Flash's back, put on and took off a yellow slicker, approached 3 barking dogs on a leash, walked over a narrow bridge, through a hay bale aisleway, over a tarp and a pile of poles. Ed and the moderator, syndicated natural horsemanship Trainer Julie Goodnight, had many positive comments to make about Flash, as did Woodside Equine Veterinarian and Judge Katherine Burke. Julie commented that she wondered if that "little black and white (currently standing 15.2H) would fit in her carry-on bag." All three participants, Aramis, Flash and Brogan (Brogan's video clip) were complimented by the clinicians as well as many audience members. Julie Goodnight also commented that when she heard that the horses that were to be in the Trainers' Challenge were half Clydesdale, she expected them to be much more drafty in appearance. She then spent quite some time explaining exactly what a "warmblood" is and the characteristics of hot and cold blooded horses with respect to training aptitude and sensitivity.